Cool Hand Online Poker is one of the new online poker sites on the internet and it has been growing in player traffic since its inception. This site has several interesting and unique offers for players including guest table promotions and free credits, a generous welcome bonus, a good variety of games and smooth game play. The site also has a strong poker community and is known to host many poker tourneys. Cool Hand Online Poker awards its new players with a very generous signup bonus of €200. This bonus is not match bonus but is a fixed sum of 200 euros that is given to every player whether he deposits 20 euros or 200 euros at the site. To cash out this bonus players will have to earn bonus points which will release the 200 euro bonus in installments of 10 euros each for very 40 points a player earns. This bonus also has a time limit ands players have to cash it out within a period of 45 days. To earn these bonus points players will have to play poker and accumulate them with every rake. Cool Hand Online Poker pays its new players 2 points for every €1 that they earn in a rake, and for every €1 paid in poker tournaments fees at the site. Players will also get points for wagers made. 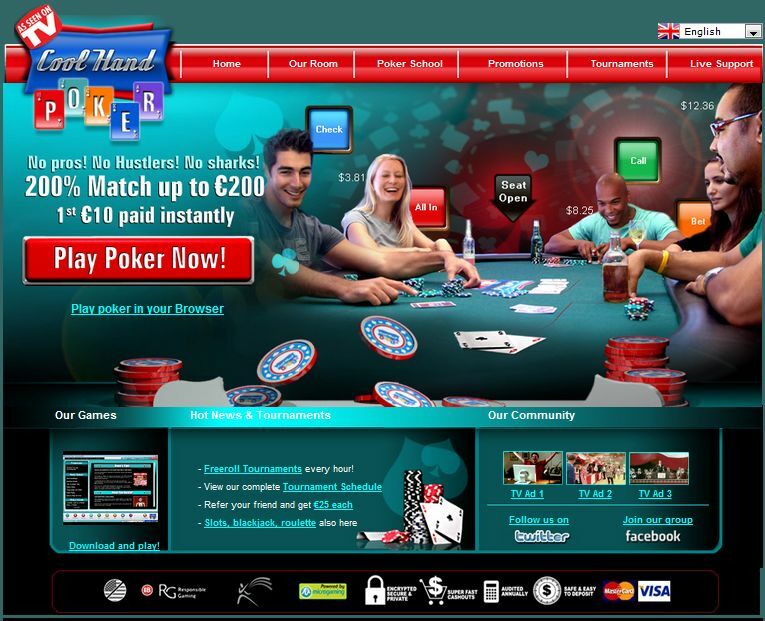 This great Online Poker site site lists several promotions for its players and gamers at Cool Hand Online Poker will be able to access fun poker tourneys, leader board challenges and many free offers like gift vouchers, MP3 players, laptops and even gaming consoles. Other interesting prizes tied to the poker games offered by Cool Hand Online Poker include music vouchers, shopping coupons, free trips and vacation getaways, buy-in to top poker tourneys and games hosted at the site. Players also get comp points for Bad Beats. This site offers the following payment options to its players. These include: Check, EntroPay, UKash, Click2Pay, ClickandBuy, NETeller, Visa, ACH, Diners Club, Paysafe, Postepay, EcoCard, direct bank transfers, echeck, Instadebit and MasterCard. This poker room runs on Microgaming software and is owned by Tower Rock Limited, while being licensed in Gibraltar. The software is reliable and has interesting graphics, quite unlike what is available online today. Players interested in these games will have to download the software to access this poker room as it is not available in Flash. Players will be able to play all sorts of poker games and poker tourneys here including MTTs and Sit and Gos. Players from the US will not be able to use this site. 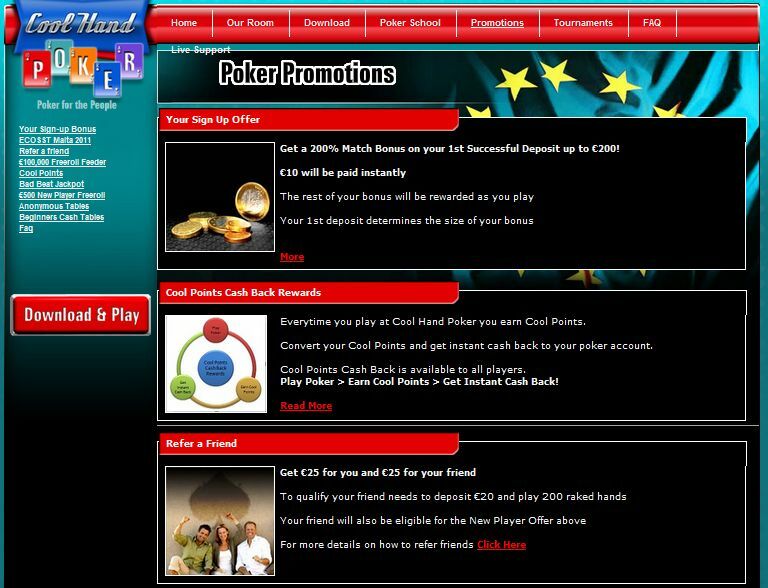 Cool Hand Online Poker has a fairly decent support system and caters to its members via email and chat 24/7. The support staff is reliable, friendly and is well informed and capable of handling your queries effectively. Players can also submit their queries via an online form which the staff will address via email. The response time is fair but support is not available to players via telephone or fax.